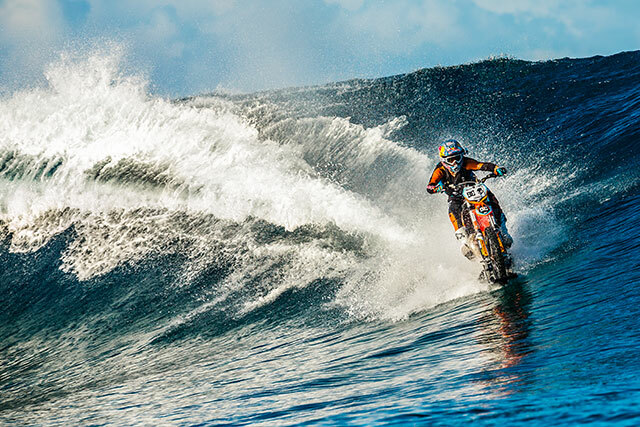 To say that Robbie Maddison (known to many as Maddo) is a living legend is not an overstatement. Dubbed the modern day Evel Knievel, Maddison is a prolific biker, stunt man and thrill seeker. 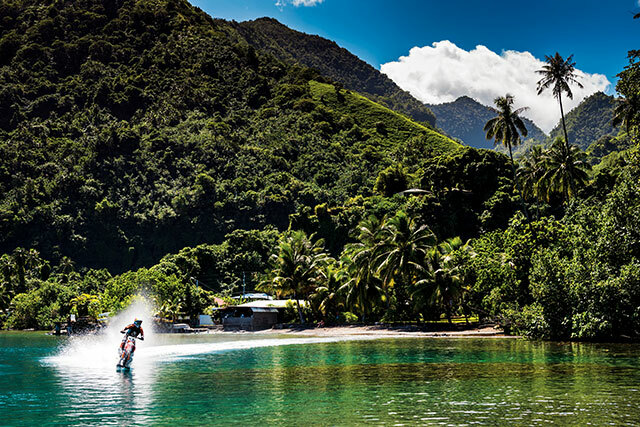 Last summer, he partnered up with DC Shoes and released a video called Robbie Maddison’s Pipe Dream that showed him surfing on his dirt bike in Tahiti. The clip gathered over 22 million views, becoming one of the most watched surf videos ever and making Robbie even more famous than he already was. The team at BookSurfCamps.com is honored to have had the chance to chat with Robbie about stunts, family life and fear. 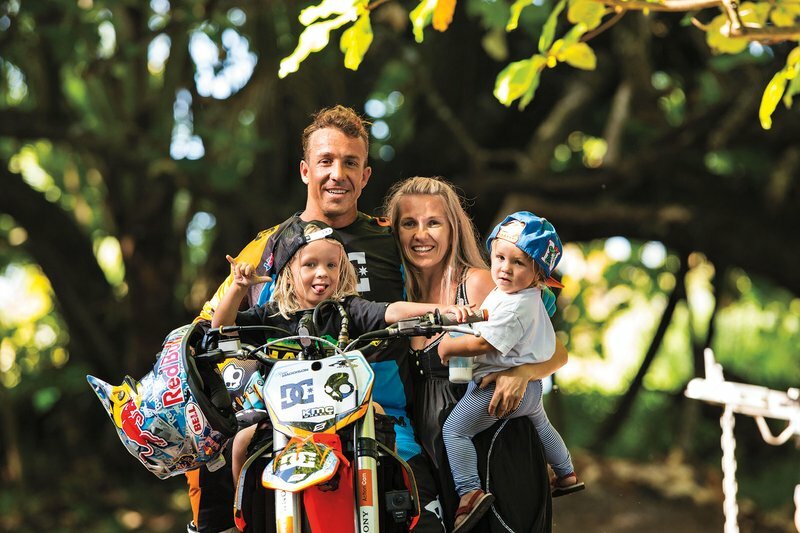 At an age when most children are still wobbly on their feet, Robbie Maddison got his first dirt bike. We asked him what made him want a bike when he was only three and his answer didn’t surprise us. “My dad rode a dirt bike/trail bike to work every day and infected me with the love by popping wheelies when he would leave and when he would return.” Popping a wheelie is a maneuver in which the front wheel of the bike comes off the ground and into the air, while the bike continues to advance on the back wheel. “One day, a young boy from up the street rode past our house on his child sized dirt bike.” That moment was a defining moment for Robbie, as he realized that he, too, could ride a dirt bike, just like his father. “Feelings of love and freedom overtook my body”, he remembers how when that realization sunk in. From that moment on, dirt bikes became a permanent fixture in his life. Once he goes through all the things that could go wrong, “I let go of the fear and enjoy the feeling of living freely, in touch with the wishes of my heart and guided by my soul. I try to be mentally and emotionally free, believing that our creator had this plan for me and I try to be a happy being of energy, living out my existence, true to who I am.” And a happy being of energy he is! Pipe Dream is Robbie Maddison’s most famous stunt and also his most ambitious project he has ever pulled off. 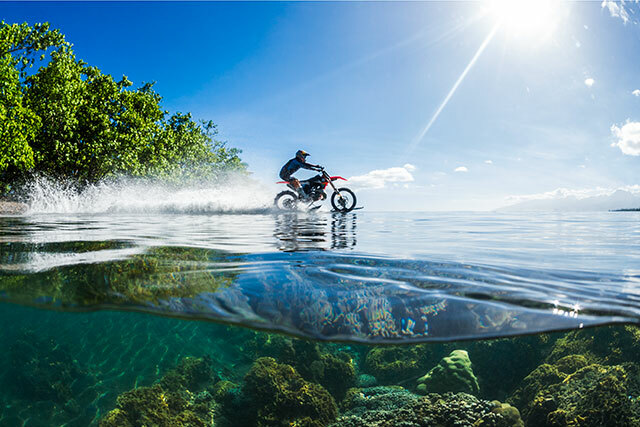 He teamed up with DC Shoes to do something that has never been done before, surf on a dirt bike. The preparations for the stunt took a whopping two years and Robbie almost lost his life when a big wave pulled him under. Robbie Maddison’s wife, Amy is an avid supporter of his career and is often a spectator at his stunts. Together, they have two young boys, who are already showing an interest in dirt bikes and jumping. Robbie supports them, the same way he received support from his parents when he was young. He is also aware that they may not be actually following in his footsteps; instead he will be following them. “Both my boys love bikes and jumping, I will do my best to enlighten them that my current situation is the combination of elements that will never exist again. I was at the right place at the right time and did what I knew I could do. I can’t wait to follow my boys on their personal journeys as a spectator, helping them with the totality of my presence to make their personal dreams come true. Just like my parents did for me.” It appears that for the Maddisons, a family that supports each other, stays together. Many people may not know that Maddison was Daniel Craig’s stunt double for Skyfall (2012). Remember the crazy rooftop bike chase at the beginning of the movie? Robbie Maddison donned a blonde wig and helped create the most exciting and well-coordinated bike stunt in the James Bond franchise. The stunt earned him a SAG award for “best stunt ensemble” and also a Taurus world stunt award for “best stunt with a vehicle”. Stunt doubling is something Maddison wishes to pursue in the future, but even more than that, he wants to try his hand at acting and do all his stunts. No surprise there! Asked about any future stunts, Maddison is secretive, saying he’s got a “super exciting stunt” in the works, but that he can’t talk about it. Who can blame him? It’s probably going to be another record-breaking stunt! Robbie Maddison is not going to stop doing what he’s doing, because passionate people like him don’t do that. His inspiring words, his determination, his passion and his achievements make him not just a great stunt rider, but also a good role model for others to follow. If reading this article gave you an insatiable appetite for surfing and travel, then we urge you to head over to BookSurfCamps.com, and browse through our vast offers to find the perfect surf vacations and surf camps that you’ve always been dreaming of!